Written by: KristaG on October 1, 2018. Boo! It’s finally October, which means it is time to start my annual countdown towards Halloween by playing some spooky games! The first game on my list for this year features some shady spirits, pestering phantoms, and adorable apparitions all competing to prove who is the scariest. This competition is carried out by frightening intruding Ghost Hunters out of their home and collecting their dropped belongings as trophies, of course! 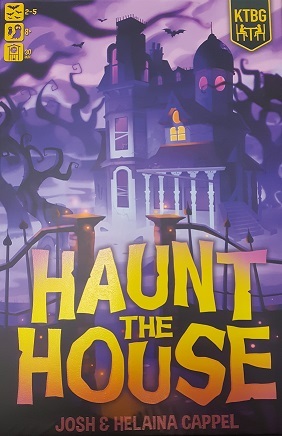 Haunt the House is a family-friendly card game for 2-5 players designed by Josh and Helaina Cappel that was published in 2018 by Kids Table Board Gaming (or KTBG for short). My favorite meeples are Purple and Green. What’re yours? These spooky ghosts are actually played the players! 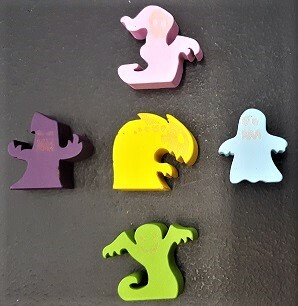 There are 5 different ghosts to choose from (color based), each with their own unique meeple representation. As a backer of their October 2017 Kickstarter campaign, I am really happy to see how some of the meeple choices I voted for turned out in the game. Out of the 5, my favorite are the purple and green ghosts. In addition to these great character meeples, Haunt the House includes creepy yet kid-friendly illustrations from Apolline Etienne. In order to scare Ghost Hunters out of the house, there must first be a house, right? To set this up, all of the included room tiles are shuffled and then, depending on the number of players, a set number are dealt face up to begin the game. Each room of a house has a different ability that can be performed there, a title, and a doorway through which the Ghost Hunter will enter. The remaining rooms are set aside for later use. The Ghost Hunters deck is also shuffled face down to create a draw deck off to the side of the play area. Each room is dealt a face-up Ghost Hunter in the doorway. That sets up the house! 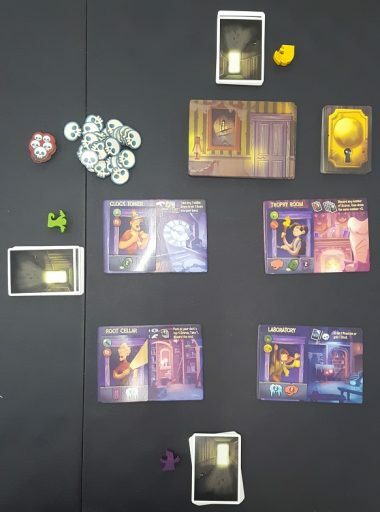 As for remaining set up, each player chooses a player color (purple, green, blue, pink, or yellow) and receives their ghostly representation and their Scare deck in the matching color. Each player should shuffle their scare deck and draw a starting hand of 3 cards. For games of less than 5 players, each player will take 1 red and 1 blue Trophy tile at random. These should be kept secret. The 2 different types of Skull tokens (1s and 5s) should also be set up near the play area within reach of all players. When preparing to scare off ghost hunters, it is important to remember that not everyone is scared by the same thing. This is also true of the Ghost Hunters, so participating ghosts will need to employ a variety of tactics (Bumps, Moans, Chills, and Creaks) in specific combinations to scare off each intruder. Starting with the first player and going clockwise, each player will spend their turn either taking 2 actions or yelling “Boo!” If taking an “action turn,” there are 3 actions that a player may choose from: refilling their hand back up to 3 cards, playing a Visible Scare or playing an Invisible Scare. These actions may be taken in any order or be performed more than once. When playing Scare cards, they are played either invisibly (face down) or visibly (face up) onto room tiles. Invisible Scares can be played as a bluff, to get rid of unwanted cards from your hand, or to potentially earn later rewards when the Ghost Hunter is frightened from the room. Conversely, playing a Scare visibly will immediately trigger the effect of the room. Some of these effects include taking any 1 Visible Scare from 1 Room into your hand, Drawing 2 Scares, and drawing 1 Phantom or gaining 1 Skull. It is important to note that if a player is choosing to play a Scare visibly, it must be one that is needed in the room (can not already be satisfied by another card and must match a shown Scare type). If a player thinks they have all of the cards needed to scare the Ghost Hunter from the room using a combination of the Invisible Scares, Visible Scares, and unplayed Scares in their hand, they may choose to shout “Boo!” instead of taking actions. If they prove to be incorrect, it ends their turn, all invisible scares that were played are discarded, and play passes to the next player. Otherwise, the player is awarded the Ghost Hunter card, all bluff cards are returned to their respective owner(s), and all players that had properly placed invisible Scare cards will be rewarded with 1 Skull. Once a player scares off their 4th (or 5th if playing with 2 players) Ghost Hunter, all other players get one last chance to properly “Boo!” someone before the game ends and the points are tallied. Points are awarded based on Skulls, Skull points on Ghost Hunters, and sets of collected gear. The player with the highest score wins. My favorites out of the 14 types of Phantoms from the base game! The game does not have to end there, though! Those pestering Phantoms that I mentioned earlier are actually an optional mechanic that can be added to the game as players get comfortable with basic gameplay. Adding Phantoms to the game doesn’t change set up other than adding another shuffled deck of cards face down over by the Skull tokens. 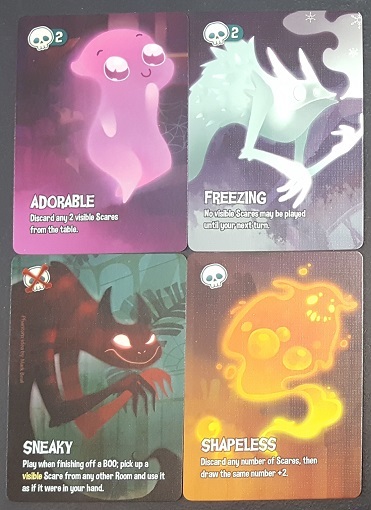 There are 14 types of Phantoms in the base game: Adorable, Charming, Freezing, Lurking, Huge, Howling, Silent, Sleeping, Shapeless, Staring, Mimic, Sneaky, Slimy, and Vanishing. Players opting to play with the Phantom mechanics will now have an option for rewards when someone correctly shouts “Boo!” during a game of Haunt the House. 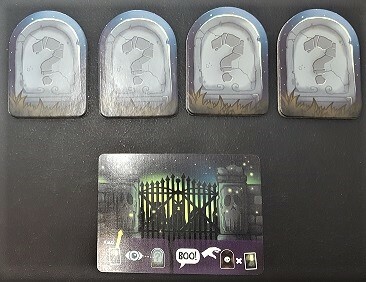 Instead of simply earning a Skull for having a correctly revealed Invisible Scare card, those players will now place their ghost meeple on the Phantom deck and, in player order starting with the active player, choose between earning a Skull or drawing 2 Phantom cards. Players choosing to take Phantoms will select 1 to keep and 1 to return to the bottom of the Phantom deck. Most Phantoms can only be played once per turn and only during an “action turn.” They are played face up on the table and then fully resolved. Some Phantoms can affect scoring (either positively or negatively) and/or can even attack other players. Kickstarter backers also had the option to receive the “Darker Corners” deluxe edition of the game. This version adds tougher rooms, bonus point opportunities, new and tougher Ghost Hunters (a.k.a. “The Professionals”), courage cards, and powerful new Phantoms. There is also a Graveyard micro expansion. It adds several new components (a “Gate” card and 4 Gravestones) as well as a press your luck mechanic. For being such a kid-friendly game (the box recommends ages 8+), I feel that Haunt the House has way more to offer than I ever expected – even as a Kickstarter backer! In my opinion, this is a game that can be enjoyed by a group of adults just as easily as by groups of children or families hosting a game night. When playing with only other adults, I’ve found I really prefer to make sure I included the Phantoms and the “Darker Corners” components. These ramp up the difficulty as well as the competition between members of my group. The speed of the gameplay is also a big factor with my group as we often like to be able to play more than one game in a night. Haunt the House plays in under an hour (our games can run longer than the quoted 30 minutes due to all of the added components and competitiveness of my companions) and allows for us to either play multiple games or move on to other spooky fun. My all-time favorite part of the game, though, actually has nothing to do with the gameplay and everything to do with my love of little extra touches and spooky things. The Skull tokens and box cover included in my copy of the game glow in the dark! Regardless of the fact that this is not a game that is really all that playable in the dark, I love the added spooky feel and ambiance that glow effect provides to my game shelf. Happy hauntings and check back next week for another spooky review!